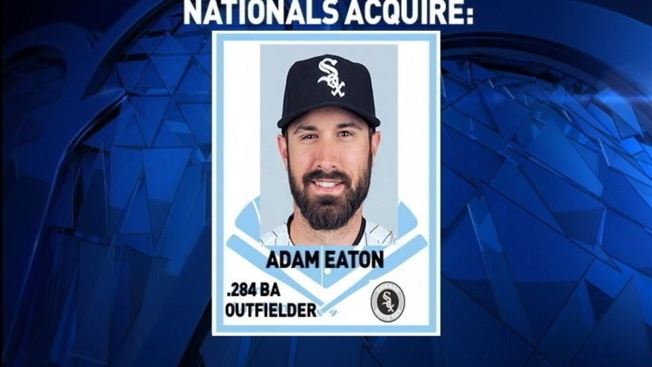 The Washington Nationals did make a deal with the Chicago White Sox during their hometown winter meetings, after all, only it was for center fielder Adam Eaton, not lefty Chris Sale. The price of Wednesday's swap still was steep: Washington parted with three young pitchers, including top prospect Lucas Giolito, hard-throwing Reynaldo Lopez -- who made the team's postseason roster -- and 2016 first-round draft pick Dane Dunning. "It's never easy to let go of your prospects," Nationals general manager Mike Rizzo said. "You feel like a proud daddy when they get to the big leagues." The trade came on the last day of the so-called "hot stove" sessions outside the nation's capital, allowing Rizzo to avoid leaving empty-handed after failing in a bid to get Sale, who instead went from the White Sox to the Boston Red Sox. "We discussed (Eaton) and several other players with the White Sox for quite a while now. It did gain momentum after the Sale deal was done," Rizzo said. "It actually came together fairly quickly over the last couple of days." Rizzo acknowledged talking with the Pittsburgh Pirates about a deal for center fielder Andrew McCutchen. By putting Eaton in center, the Nationals can move Trea Turner, runner-up for 2016 NL Rookie of the Year, back to his natural position, shortstop. Eaton, who turned 28 Tuesday, has three guaranteed seasons left in a $23.5 million, five-year contract that calls for him to earn $4 million next year, $6 million in 2018 and $8.4 million in 2019. The deal includes a $9.5 million team option for 2020 with a $1.5 million buyout and, if 2020 is exercised, a 2021 team option for $10.5 million with a $1.5 million buyout. Eaton has a .284 career batting average with a .357 on-base percentage and a .414 slugging percentage, with 34 homers and 177 RBIs in five seasons in the majors with the White Sox and the Arizona Diamondbacks. He led the AL in triples in two of the past three seasons. "He's a high-energy guy," Rizzo said. "There's an edge to him." Here's the way Nationals manager Dusty Baker described Eaton: "The only negative I've heard is you have to calm him down a little bit, because he goes 100 percent all the time, which is not a bad way to play this game. ... He's not afraid to get dirty and grimy, greasy, nasty, do everything there is to beat you." Last season, Eaton hit .284 with 14 homers, 59 RBIs and 14 stolen bases, while leading the majors with 18 outfield assists. "We see the arrow still going up with him," Rizzo said. As for where Eaton might hit in the lineup, like Bryce Harper and Daniel Murphy, he bats left-handed, Baker said, "That remains to be seen. We do have options to try to break them up." For the White Sox, who picked up high-priced third baseman Yoan Moncada, considered by many the top young talent in baseball, along with pitchers Michael Kopech and Victor Diaz, and outfielder Luis Basabe, in the Sale trade, this represents another big step in a significant overhaul after a 78-84 season and fourth-place finish in the AL Central. The 22-year-old Giolito, a first-round pick in the 2012 amateur draft, made his major league debut in June and went 0-1 with a 6.75 ERA in six starts for Washington. Lopez, also 22, was 5-3 with a 4.91 ERA in 11 games, including six starts, for the Nationals in 2016. The 21-year-old Dunning was the 29th overall pick this year out of the University of Florida. "We view all three of them, actually, as having the potential to become front-end-of-the-rotation pitchers," White Sox GM Rick Hahn said. "There's still a fair amount of development with each of them."